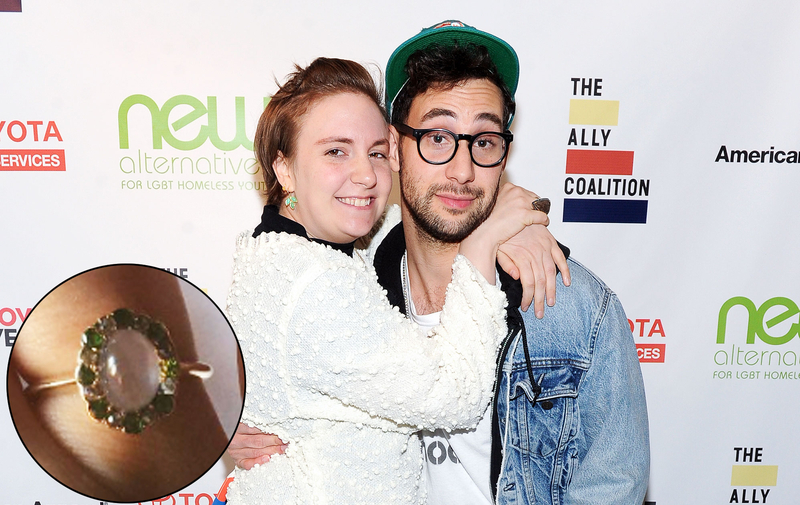 Lena Dunham&apos;s longtime boyfriend Jack Antonoff surprised her with a ring as an early anniversary present on Wednesday, April 20. The Girls star, 29, debuted her new bling — which she wears on her right hand, not her left — via Instagram. "Early anniversary gift from boyfriend of the year @jackantonoff (care of @eriebasin in Brooklyn,)" she wrote of the delicate sparkler. The vintage accessory features a narrow gold band with smaller green and gold colored gems surrounding a larger center stone. "Turn of the century moonstone and peridot," Dunham said of the unique piece. "I will so enjoy looking at it while I type words." In the same post, the Golden Globe winner quickly dispelled any rumors that her new jewelry could have been an engagement ring. "#ringbrag #jewelrybitch #friendshipring," she wrote. Dunham previously declared that she and the Bleachers frontman, 32, who have been dating since 2013, wouldn&apos;t get hitched until LGBT marriage was legal in all 50 states. "The idea of having a celebration that can&apos;t be fully shared among all the people in my life and all the people that we love just doesn&apos;t really feel like a celebration at all," the HBO series creator told Ellen DeGeneres in May 2015. "So until that&apos;s something that everyone can join into with no sense of being left out on any level, politically, emotionally, it&apos;s just not something that we&apos;re gonna do." What do you think of Lena&apos;s moonstone ring?